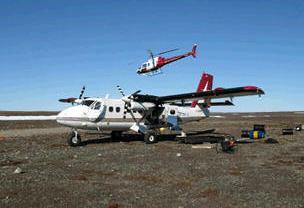 October 4, 2011 - Discovery Air Inc. subsidiaries Air Tindi Ltd. and Great Slave Helicopters Ltd. have formed a new partnership – Auyuittuq Aviation – with a group of Inuit shareholders from the Kivalliq and Baffin regions of Nunavut to better serve the needs of the burgeoning mining industry on Baffin Island. “The mining and exploration industries in Nunavut are growing rapidly and new opportunities are being created almost daily,” said Auyuittuq Aviation President Simon Merkosak. Nunavut is the largest and newest federal territory of Canada; it was separated officially from the Northwest Territories on April 1, 1999, via the Nunavut Act[ and the Nunavut Land Claims Agreement Act, though the actual boundaries had been established in 1993. The creation of Nunavut – meaning "our land" in Inuktitut – resulted in the first major change to Canada's map since the incorporation of the new province of Newfoundland in 1949. Nunavut comprises a major portion of Northern Canada, and most of the Canadian Arctic Archipelago, making it the fifth-largest country subdivision in the world. The capital Iqaluit (formerly "Frobisher Bay") on Baffin Island, in the east, was chosen by the 1995 capital plebiscite. Other major communities include the regional centres of Rankin Inlet and Cambridge Bay. Nunavut also includes Ellesmere Island to the north, as well as the eastern and southern portions of Victoria Island in the west and Akimiski Island in James Bay to the far south. Nunavut is both the least populous and the largest in geography of the provinces and territories of Canada. One of the most remote, sparsely settled regions in the world, it has an estimated population of over 33,000, mostly Inuit, spread over an area the size of Western Europe. Nunavut is also home to the northernmost permanently inhabited place in the world, Alert. Auyuittuq Aviation will primarily operate out of its main office in Iqaluit, the administrative and transportation hub of the Qikiqtaaluk Region. It will focus its efforts on the transportation of workers and freight for the mining and exploration sectors as well as charter work and wildlife surveys for the Government of Nunavut. Founded in 2004, Discovery Air is a specialty aviation services company operating across Canada and in select locations internationally. With over 130 aircraft, it is one of the largest air operators in Canada, employing more than 600 flight crew, maintainers and support staff to deliver a variety of air transport, maintenance and logistics solutions to a wide range of government, airline and business customers.